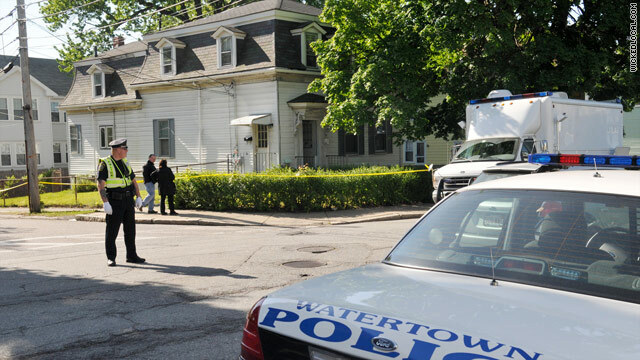 Law officers cordoned off a home in Watertown, Massachusetts, on Thursday, part of several raids in the Northeast. Why would an American, living the American dream, set out to attack the United States? Watch the special "AC360°" investigation "American al Qaeda," Saturday at 8 p.m. ET on CNN. (CNN) -- Michael Sobelman gawked in amazement as the FBI stormed a gas station in Brookline, Massachusetts, one of several Thursday morning raids in the Northeast tied to the Times Square bombing investigation. "You'd never have thunk something like this is going on," said Sobelman, the owner of a nearby deli. "I'm shocked that it could happen in an affluent community like this." He was one of several people in northeastern towns who watched the FBI execute search warrants related to the investigation into the financing of the plot to set off a car bomb in New York City's Times Square. A law enforcement source said the locations may have been involved in the transfer of money to Faisal Shahzad, the suspect in the case, but there was no specific information indicating that people there knew about the plot. Video: 'No immediate threat' in Mass. Sobelman and other Brookline residents saw police swarm the area and cordon it off. He strolled down the street from his restaurant, Michael's Deli, to check out what he said was rare commotion along the retail and commercial stretch. Media and police packed the area as a handful of helicopters hovered over the scene. He saw the FBI remove material from the gas station, a place he's frequented for car inspections and repairs. "You can see them taking stuff out," he said, noting that the area had been secured and that people can use the sidewalks nearby. Sobelman said crime is "pretty low" in Brookline, a town just outside Boston with a "fantastic" police department. He said the town is ethnically and religiously diverse, a community with many groups, including Jews, Muslims, Middle Easterners, Asians and Europeans -- and food to match, like kosher food and falafel. Several blocks away, there's a huge medical complex. Sobelman recognized some of the people from the service station. And in the past, they have frequented his deli. "I tip my hat to the FBI and praise them for their work and their diligence and looking behind the scenes into everything," he said. In Watertown, Massachusetts, a man who lives near the home where a search warrant was executed told CNN affiliate WCVB that he was sitting in his living room watching television about 6 a.m. when "I heard an FBI agent scream, saying 'Don't move' or 'Put your hands up,' something like that." "I thought I was dreaming, actually, because in a small town, who would think, you know, that you'd hear an FBI person?" said the man, who did not give his name. When he looked out the window, he said, he saw 15 or 20 FBI agents lined up, with their guns pointing at the house. He said that after a few minutes, a couple of agents went inside. "I was expecting to hear gunshots or something, you know, but there wasn't ever any gunshots," he said. The man said his wife went on the porch and videotaped the incident. After a few minutes, agents brought a man out in shackles, put him into a car and drove away, the man said. He said he'd never seen the man before but noted that every few years, new residents move into the home. Back in Brookline, Rosalyn Finn, a store manager, heard about the commotion down the street but didn't know exactly what happened. When she was told, she said sarcastically: "Oh, I feel so safe now."